What Are Mac OS X Snow Leopard’s Hub Applications? At the heart of your digital hub is your Macintosh and Mac OS X Snow Leopard. To use and manipulate all the data that arrives at your Mac, your computer needs software, which provides instructions on what to do with the information that you send. Today, people can try to juggle five or six electronic wonders. Each device typically comes with its own software, power adapter, and connectors to the outside world. Although managing one or two devices isn’t terribly difficult, when you have a half-dozen cables, power adapters, and software to cart around, the digital life can become pretty bleak. To combat this confusion, Apple came up with the idea of a digital hub, whereby your Macintosh acts as the center of an array of electronic devices. By using standardized cables, power requirements, built-in software, and even wireless connections via Bluetooth and 802.11x wireless, this goes a long way toward simplifying your interaction with all the electronic gadgets that you use. Think of the digital hub as a wagon wheel. At the center of the wheel is your Macintosh. At the end of each spoke is a digital device. iPhoto: Use iPhoto to download, manipulate, and organize your favorite digital photographs. After everything is just so, iPhoto can print them, burn them to disc, or even help you design and order a hardbound album! iTunes: iTunes offers the ability to create and manage your music and movie collection, along with sundry other media such as podcasts, Internet radio, and audiobooks. You can also purchase and download audio tracks and video from Apple’s iTunes Store. iTunes can even burn CDs! iMovie: Every film director needs a movie-editing suite. iMovie gives you the chance to set up Hollywood in your living room with outstanding results. iDVD: As home video moves toward the digital realm, iDVD becomes an essential tool for authoring your own DVD media. Home movies will never be the same! GarageBand: Call it a “music-building” application! Even if you can’t play a note, GarageBand makes it easy to create your own original songs, and if you are a musician, you can turn your Mac into a production studio. iWeb: Interested in producing a professional-quality Web site, but afraid that you’ll have to give up your personal life to build and maintain it? Never fear; with iWeb you can join the Web publishing crowd the easy Apple way. iCal: To help keep your hectic digital lifestyle in order, iCal offers complete calendar features. Besides tracking your dates and appointments on your Mac, you can publish calendars on the Web or share them with different parts of the digital hub. If you have an iPod, you can even download your appointments and carry them with you. 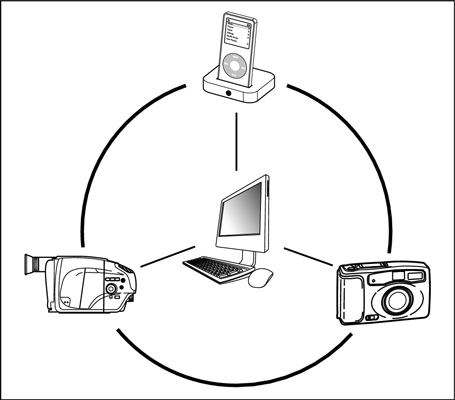 iSync: With so many digital devices at your disposal, it gets hard to keep them all straight. iSync is software for automatically synchronizing contact and calendar information between cellphones, your personal digital assistant (PDA), an iPod, the Mac OS X Address Book, and iCal.